…or so they say. (Shakespeare, from Romeo and Juliet, in case you were wondering). All I know is they ruddy well smart. No matter how sudden/swift or agonisingly slow, how pleasant or unpleasant, they hurt. Ouch. 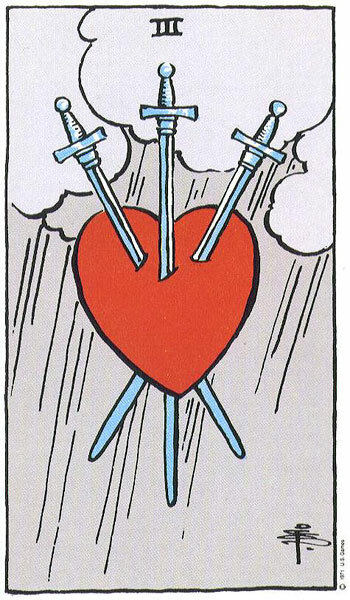 Like the good ole Three of Swords in the Tarot deck, my old familiar arch nemesis meaning; a ‘sharp pain to the heart’. Some partings hurt more than others of course. Sometimes friendships or relationships can fall by the wayside through sheer neglect, no malice or intent on either part, just time and distance does it’s work. Sometimes they go out in a blaze of glory with door slamming and bad feeling, leaving a sour or bitter taste in the mouth. Sometimes we can watch as the parting comes about, foreseeing it and knowing it comes, yet still simply watch in perpetual confusion or sadness as it happens anyway. Sometimes the partings are with people we hold so dear, so integral to our lives that they rock our foundations for awhile, leaving us bewildered and unsettled. Sometimes the apparent reasons are so small, or feel so insignificant they leave us shocked and reeling, unable to rationalise. Neighbours. Friends. Family. Loved ones. Each affect us in different ways. I have for many years believed that people are in our lives for either Reasons, Seasons or Lifetimes. Even knowing this however does not preclude the hurt that follows such partings, despite sometimes recognising from the outset that a person is only ‘visiting’ our life for a time. How the parting comes about also determines just how keenly it affects us. A grieving bereavement for example as opposed to discovery of infidelity or deceit; such very different feelings are involved and yet in the end it’s all the same, resultant sadness. All such partings are in actual fact grieving, and we go through the same familiar processes. Denial. Anger. Bargaining. Depression. Acceptance. Another factor to consider is this; the greater the love or the ‘connection felt’, the stronger the parting is felt. I have felt such great love that I’ve grieved for quite literally years before the pain subsides. Yet with others it’s been barely but a swift, sweeping general sadness that comes and goes, passing like the tides or the moon’s phases. They say “it is better to have loved and lost than never to have loved before” (Alfred Lord Tennyson). I agree, and would hate to live a loveless life just to avoid the hurts. However I do have to remind myself of this when partings are raw, fresh and bloody. It’s always just so. very. sad.